Until disposable sanitary pads were created, cloth or reusable pads were widely used to collect menstrual blood. Women often used a variety of home-made menstrual pads which they crafted from various fabrics, or other absorbent materials, to collect menstrual blood. 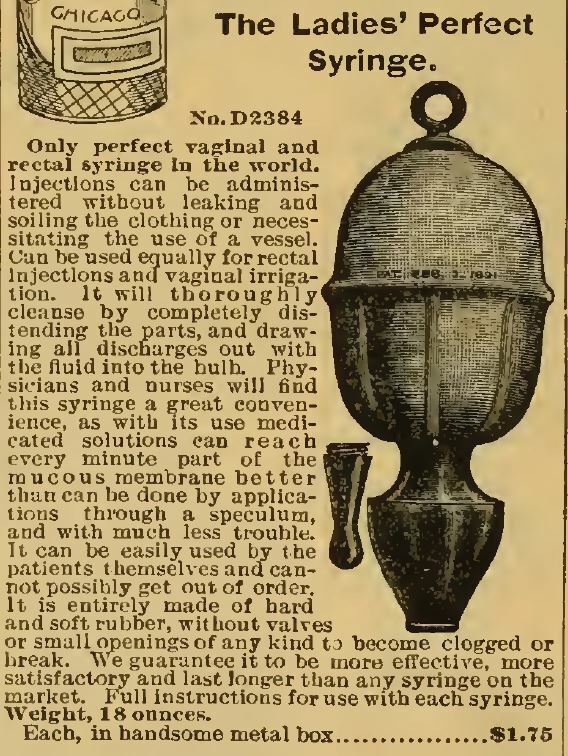 Menstrual cups weren’t far behind. 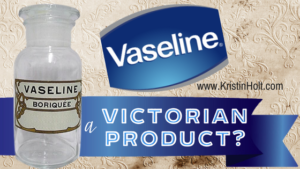 The first was invented just after turn of the century. Lister’s Towels advertisement in Arizona Republic. Phoenix, Arizona, 7 June, 1906. 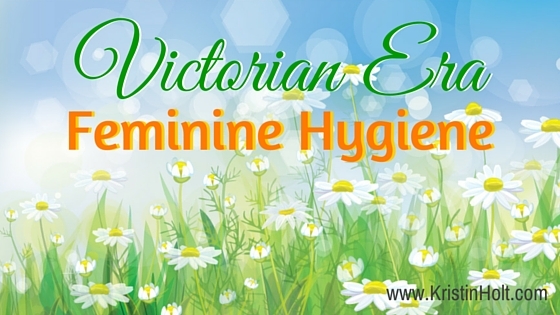 According to Wikipedia, advertisements in the Victorian era were intentionally vague as taboos prevented open discussion of feminine hygiene, birth control, or menses. Item No. 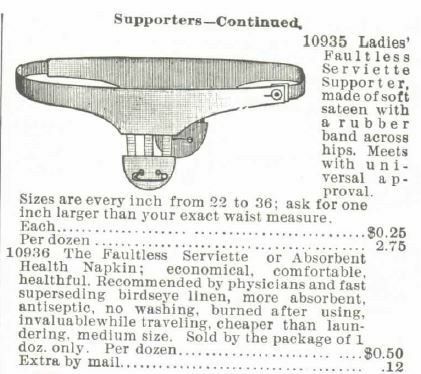 10935: Ladies’ Faultless Serviette Supporter, made of soft sateen with a rubber band across hips. meets with universal approval. Sizes are every inch from 22 to 36; ask for one inch larger than your exact waist measure. Each = $0.25. Note the safety pins that hold the “safety belt” in position at the correct depth to fit snugly against the body. Item No. 10936: The Faultless Serviette or Absorbent Health Napkin: economical, comfortable, healthful. Recommended by physicians and fast superseding birdseye linen, more absorbent, antiseptic, no washing, burned after using, invaluable while traveling, cheaper than laundering, medium size. Sold by the package of 1 doz. only. Per dozen = $0.50. Extra by mail (whatever that means) = $0.12. 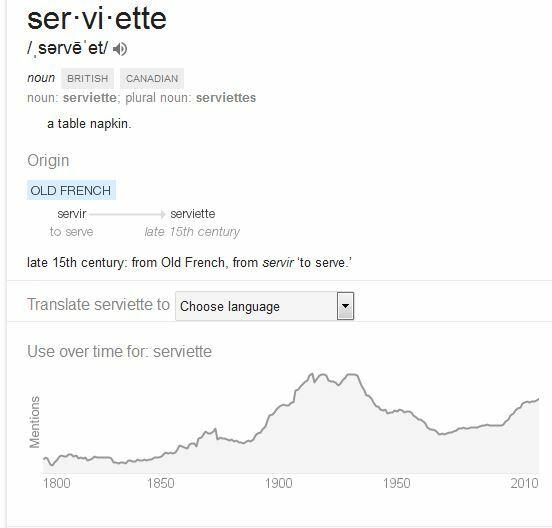 “Serviette” simply means “table napkin”…and in this case, napkin as in ‘Sanitary Napkin’. Ladies’ Black or white Sateen Combination Belt, with hose supporters and points for safety belt. Montgomery Ward & Co Spring and Summer catalog, 1895. Item No. 10931: Ladies’ Black or White Sateen Combination Belt, with hose supporters and points for safety belt; size 24 to 34 inches. (see cut.) Each = $0.25 Note: the hose supporters fall along the outside of the thighs; the safety belt points fall center front and center back. The “cut”, a.k.a. engraving/carving (image), shows the side view as if the wearer were turned in profile. Item No. 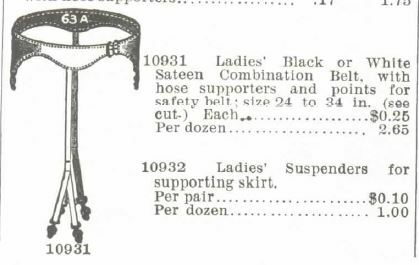 10932: Ladies’ Suspenders for supporting skirt (not pictured, but is pictured below, in the Sears, Roebuck & co. catalog image). Per paid $0.10. Note: such suspenders were worn to distribute the weight of the lady’s skirt to her shoulders as well as helping to keep the skirt up where it belongs about her waist. The suspenders were worn beneath the blouse, unlike men’s suspenders which were worn atop the shirt and beneath the waistcoat/vest. 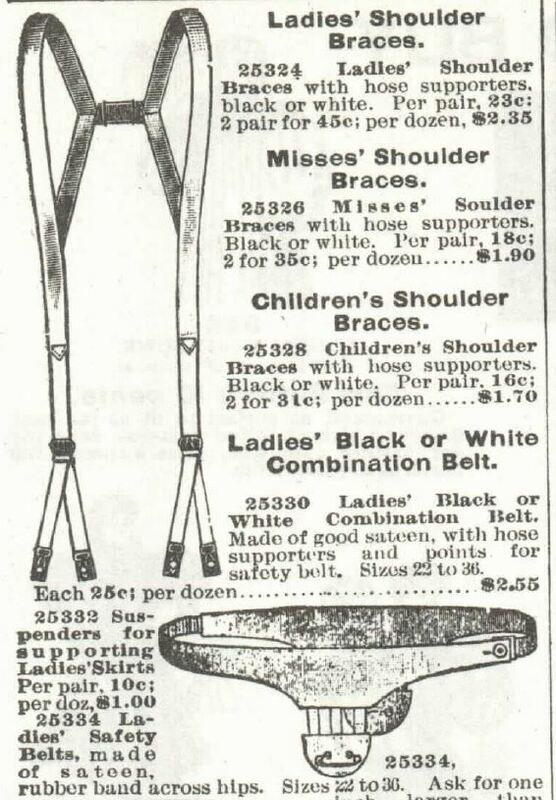 Ladies’ Shoulder Braces and ladies’ Black or White combination Belt. Sears Roebuck and Co. 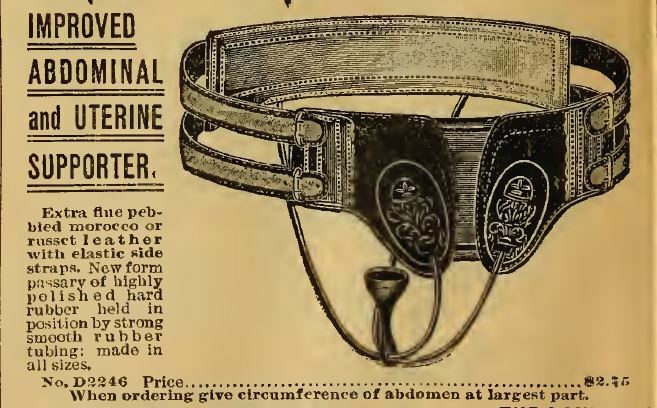 Catalog no 104, 1897, page 335. Sanitary Cloth. 1897 Sears Roebuck and Co. Catalog No. 104, p 335. Item 25338 “Serviette” Sanitary Cloth. These Serviettes are made of the finest absorbent cotton, with a layer of absolutely impervious material, which insures cleanliness. Absolutely antiseptic, ready for instant use. These Serviettes possess from three to four times the absorbent qualities of the best toweling. 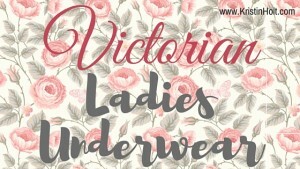 Recommended by the medical profession as indispensible in every ladies wardrobe. [sic] Each, 4c. ; per dozen…$0.40. At least the Sears offering of sanitary napkins are apparently meant to be washed. Other than the ridiculously wealthy, the 19th century Americans didn’t harbor “use and dispose” attitudes. The disposable mentality belonged to the 20th century and beyond. No. 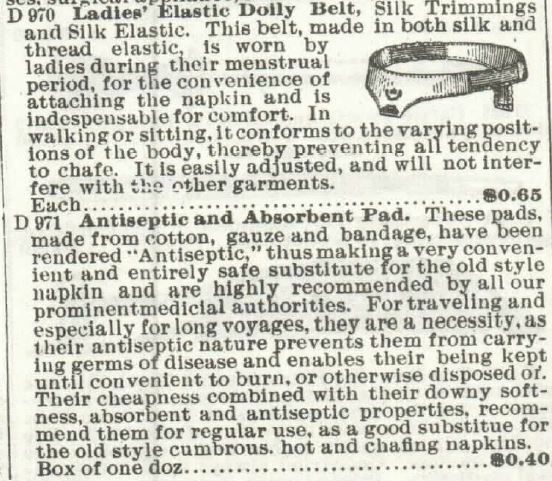 D2261 Ladie’s Doily Belt [sic]. Made of Soft Sateen and Silk with Rubberband [sic]. An almost necessary article for ladies during their menstrual period for the convenience of attaching the napkin or pad. It is easily adjusted, and will not interfere with other Garments. Each, with two cotton shields or pads…40c. Item D2262 Sanitary Napkins, Serviette. Antiseptic and Absorbent pads, made from cotton gauze and bandage, rendered antiseptic. A convenient and healthy substitute for the old style napkin; highly recommended by all prominent medical authorities. Their cheapness, combined with their downy softness, absorbent and antiseptic properties, recommend them for regular use, and they are especially convenient and healthy when traveling. Price, box of one doz…40c. 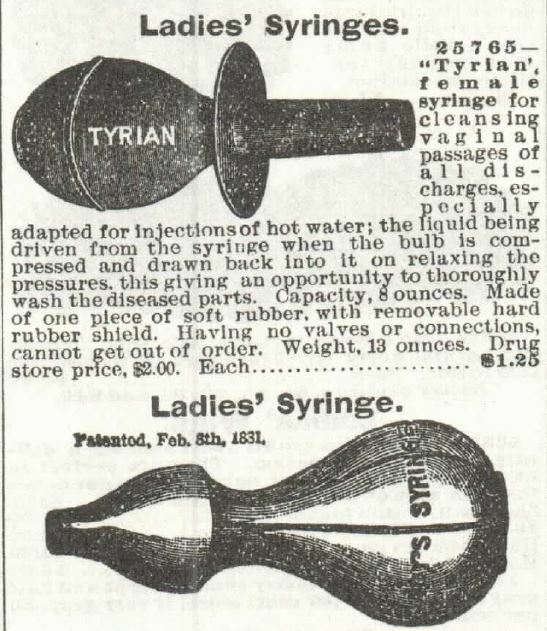 Women had long used syringes (at least by the 17th century) for douching. 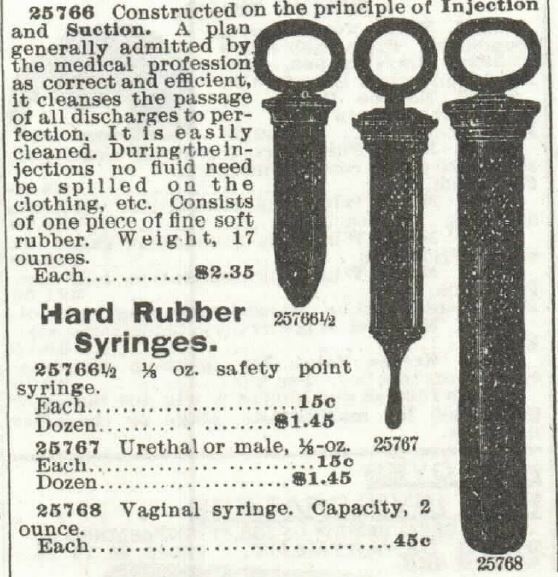 Both Sears, Roebuck & Co. and Montgomery, Ward & Co. catalogs sold various style syringes for feminine hygiene. According to the advertisements, the devices were used for post-coital cleanliness and to (with additives such as alum, baking soda, or vinegar) reduce the risk of pregnancy. Douches were apparently employed during menses as well as post-partum (which may have contributed to “childbed fever”, a.k.a. peritonitis following childbirth). Advertisements were intentionally vague as a newspaper reporter had been arrested in 1882 for obscenity. 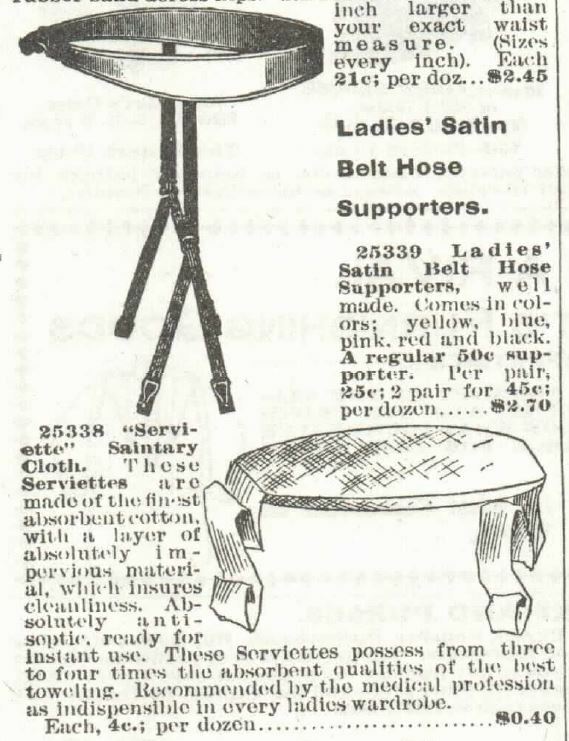 Similar products were advertised in Sears, Roebuck & co. catalog of 1897 and Montgomery, Ward & co. of 1895. Uterine Prolapse must’ve been relatively common and without the surgical intervention of today, devices such as this kept bits tucked inside. 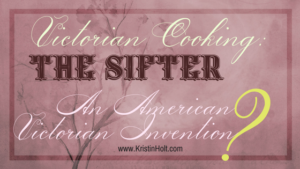 While I’m fascinated with all things Victorian, I’m grateful I was born well beyond it. 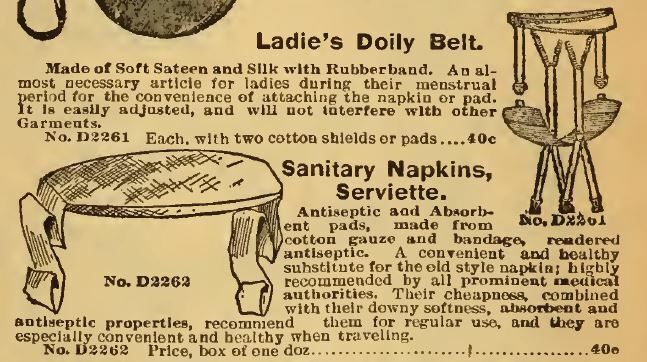 I’m glad sanitary belts were part of a bygone era when I reached puberty. I’ll read books set in the past, I’ll write of the Victorian era with much affection, but I’ll remain here–with all the modern conveniences–thank you. 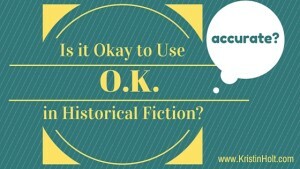 Is it Okay to use O.K. 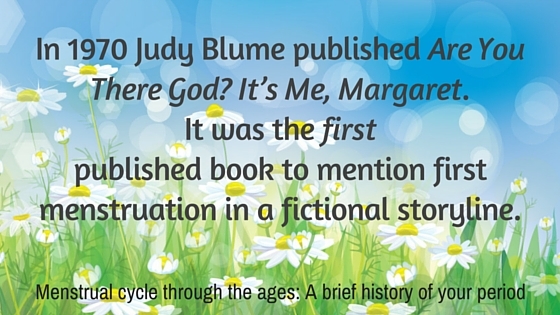 in Historical Fiction? Great, fascinating post. Very informative.